A senior Environmental Protection Agency official is under investigation for allegedly aiding John Beale, the EPA official who pretended to be a CIA spy and bilked the agency out of nearly $900,000 in fraudulent travel vouchers and timecards. The Washington Post reported that a high-ranking female EPA official approved much of Beale’s excessive and falsified travel expense reports and is now under investigation by the agency’s Office of Inspector General. The woman has not been identified and the report is not yet public. This is the third deputy assistant administrator who worked under current EPA head Gina McCarthy when she ran the bureau’s Office of Air and Radiation to be investigated by the EPA’s inspector general. The Free Beacon obtained Beale’s travel vouchers via a Freedom of Information Act request in November. They showed the deputy assistant administrator spent tens of thousands of dollars on five-star hotels and first-class airfare. However, the EPA redacted the name of the supervisor who approved his travel vouchers. Those redactions are being appealed. Former Deputy Assistant Administrator Robert Brenner, a longtime colleague and friend of Beale’s at the EPA who initially approved Beale’s illegally high pay, was previously investigated for accepting an $8,000 discount on a Mercedes-Benz allegedly arranged by a lobbyist who did business with the EPA. The Office of Inspector General believed it could prove that a crime was committed, but the Justice Department declined to pursue the case. Brenner retired before the office could interview him. The new report will likely provide more ammo for congressional Republicans who have been investigating the case. The House Committee on Oversight and Government Reform promised to continue investigating the case in a statement to the Free Beacon Wednesday. 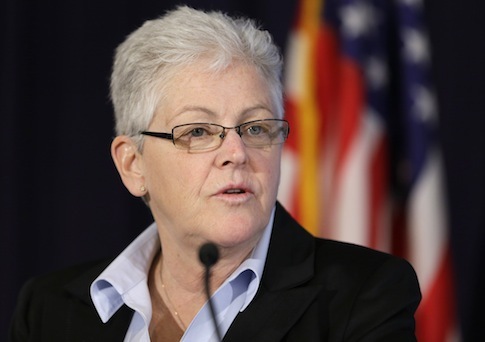 "We now know that all three senior officials directly supervised by Gina McCarthy in her previous role with the EPA have been implicated in this egregious fraud," House Oversight and Government Reform Committee Chairman Darrell Issa (R., Calif.) said. "This raises serious questions about her capabilities as a manager and leader, which the Committee will investigate along with other systemic problems at the EPA." The Inspector General released two additional reports yesterday finding that the EPA Office of Air and Radiation received warnings of Beale’s illegal salary bonuses as early as 2010, three years before he was forced to resign. Beale took 33 trips between 2003 and 2011 that cost taxpayers $266,190. He flew first class on 70 percent of the trips, even though it was required that he use business class if available. Beale also was earning well above the legal salary limit—more than the vice president of the United States—thanks to an illicit retention bonus. Beale is scheduled to be sentenced in federal court on Dec. 18. He has agreed to pay more than $1 million in restitution and civil forfeitures as part of his plea deal. This entry was posted in Issues and tagged EPA, Gina McCarthy, Government Waste, Obama Administration. Bookmark the permalink.